The easiest inseam pocket to make is one in which you cut out a pattern that includes the pocket, pocket lining, and the garment itself all in one piece. Even though your pattern may call for pocket lining pieces to be cut and sewn to the garment separately, the construction steps are the same. 1. Mark the pocket opening on your fabric. 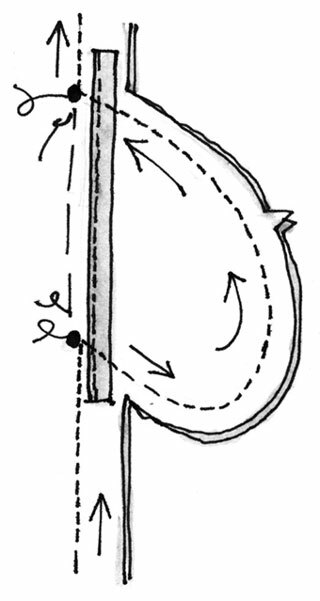 The pocket openings are usually marked with dots on the seamline on the pattern paper. So, using your fabric marker, mark the pocket placement by transferring those dots onto your fabric. 2. Stay the pocket opening. Staying an area means to stabilize it so that it doesn't stretch out. For example, staystitching prevents a curved edge from stretching out of shape while you're working on the project. To stay the pocket, you use a strip of twill tape. Cut a piece of twill tape 2 inches longer than the length of the pocket opening. Place the tape on the wrong side of the front pocket seamline, centering it next to the marks for the pocket opening. Stitch it to the front pocket fabric only. This is a pocket stay and makes the pocket opening "stay" in shape, even when you hang your hands in your pockets for hours at a time. 4. Pin and baste the pocket opening shut. Basting in sewing is nothing like basting a turkey in the kitchen. In sewing, basting means to temporarily hold pieces of a project together. You can hold them together with your hands (called finger-basting), with long-hand or machine stitches (called hand-basting or machine-basting), or with pins (called pin-basting). The long stitches and pins are easily removed to check and adjust the fit before permanently sewing the seam together. Pin the garment and front and back pocket pieces, right sides together. Baste the pocket closed, basting the pocket opening from dot to dot. This way, after you stitch and press the pocket, you can pull out the basting stitches and expect a perfectly formed pocket opening! 6. Pin the garment, right sides together, and then sew up the side seam, starting from the bottom of the project, pivoting at the pocket opening dots. 7. Clip from the raw edge to the dots at the top and bottom of the back pocket seam allowance only. When you press open the clipped seam allowance, the pocket falls toward the front of the garment. Why is this a good thing? When the garment is worn, the pocket is pushed toward the front of the garment. By clipping the seam allowance, the side seam isn't pulled out of whack. 8. Press the pocket seams flat and together, from the wrong side of the garment. Then, again from the wrong side, press the side seams open by pressing the pocket toward the front of the garment. 9. Remove the basting stitches by simply pulling out the contrasting bobbin thread.